I'm not embarrassed to admit it but I love Young Adult fiction even though I'm in my early thirties and have two children. To me there's something really delightful in slipping into the mindset of a teenager like Rory Devereaux and pretending I'm young again. 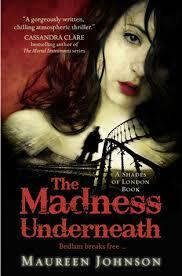 The Madness Underneath is the second instalment of The Shades of London series by Maureen Johnson. I've previously read the first book of the series, The Name of the Star and thoroughly enjoyed it. Now I think I'm a bit hooked and this book The Madness Underneath, ended on the highest cliff hanger I've ever come across in a book and I'm now experiencing painful withdrawal symptoms. I think the reason why I like these books is because of Rory Devereaux, the sassy teen from Louisiana U.S.A who's come to study at college in London. There's something quite adorable about her but she's also feisty and wise for her age. She's really interesting because she is real and has flaws just like everyone else. Without giving too much away for those of you who are not familiar with The Name of the Star, Rory is recovering from a traumatic ordeal. Except she's not really traumatised she'd bored out of her mind and itching to get back into the action and hang out with the Shades of London, which is both dangerous and thrilling. Rory is not a normal teenage girl, she has the sight she can see ghosts and through that she has seen a side to London that only a very few people at the top know about. In The Madness Underneath, Rory really finds her feet in the world despite her life falling apart. She's more powerful than she had bargained for after her ordeal and with that power comes great responsibility for she has the power to prevent the Shades from being shut down. But she's also in terrible danger. Unlike The Name of the Star, this book gets off to a slow start, I felt like there wasn't much happening but it didn't fustrate me as the superb characterisation of Rory is so great that I'm just happy to coast along with her as she goes from one disaster to another. Some people might say that this book is lacking in plot and action but I think this is a pivotal book where Rory finds her feet and figures out what direction she should be going in. She's at a crossroads, should she go back to the U.S, or try and catch up at Wexford or should she give up everything to become a shade? She's choosing between her heart, her head and spirit. So the book can feel a little slow, I think it's gentle and absorbing but it's worth going through as it does eventually kick off and my oh my, does it kick off. So many things happened that I wasn't expecting to happen and when I finished the last page I was gutted! "I was in London, a city of stone and rain and magic. The red buses, telephone booths, and postboxes were a violent shock against the greys of the shy and stone. Red was blood and beating hearts." The atmosphere of this book was superb as a Londoner I felt Maureen Johnson had it spot on. I have a real thing for urban fantasy set in London, Neil Gaiman's Neverwhere is firmly at the top of my TBR list. I like the fact that Rory is American and we get to see how Americans view our way of life. Fortunately The Shadow Cabinet, the third instalment in The shades of London series is already out. I don't know I would have coped if I would have to wait!